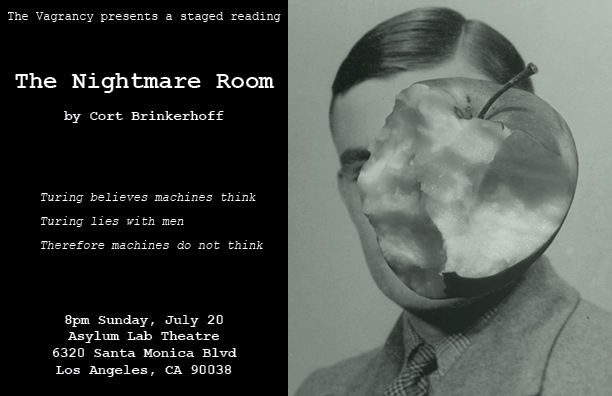 My new play THE NIGHTMARE ROOM will have a staged reading at the Asylum Lab Theatre on Sunday, July 20 at 8pm. The reading is directed by Doug Oliphant and features Steve Madar and Paul Turbiak. In 1954, war hero and father of computer science Alan Turing sets out to reinvent himself as a biologist, but a conviction for gross indecency with the punishment of chemical castration threatens to shatter his legacy. 8pm Sunday, July 20 — Asylum Lab Theatre — 6320 Santa Monica Blvd — Los Angeles, CA 90038 For more information and to RSVP, click here.